At a fast paced, early stage startup, it’s easy to remain cold while shuffling candidates through your recruiting process. Most companies make the mistake of communicating with candidates quickly and simply, while concentrating their attention solely on onsite interviews. When a startup’s userbase is growing and the headcount needs to increase accordingly, it’s understandable that this becomes the standard recruitment process. The truth, however, is that a candidate’s experience begins much earlier when they start considering new opportunities, looking at company websites and connecting with recruiters early in the process, and it continues all the way to when they sign their offer. Every impression you make along the way matters, especially when a candidate has multiple offers from different startups. Don’t let a cold start at the beginning of your hiring funnel be the reason a candidate ultimately decides not to join your company. 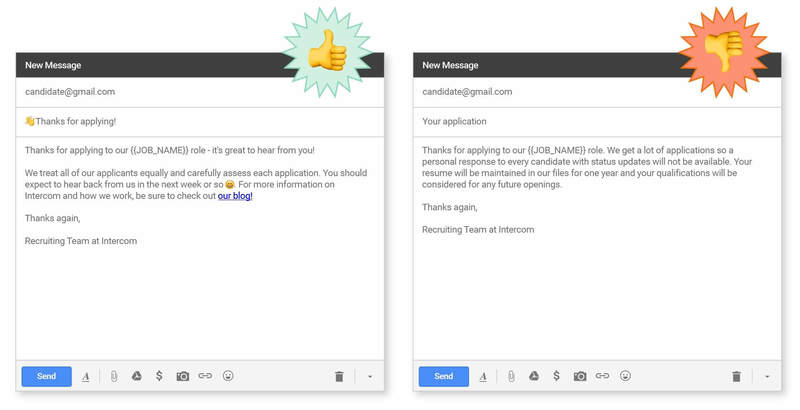 Here at Intercom the candidate experience starts long before any candidate ever comes into the office and is deeply integrated into our recruiting identity. As our former Recruiting Coordinator, I have first hand knowledge of how significant every small communication and interaction is to a candidate. Here are four small but impactful ways you can set your startup apart from the recruiting status quo. When it comes to job descriptions, hiring managers and recruiters often get caught up in ensuring every small detail of the role is represented. In turn, the job description become wordy and overwhelming to candidates without actually giving them a clear picture of the responsibilities of the role. On a high level, consider the team’s mission, how it plays in the greater company’s goals, and why now is the best time to join the team. What will I be doing? ? This is the opportunity to think about why the role is open, what the person hired for this role will be doing, and what the expected outcomes are. What skills do I need? ? Take into account any necessary requirements like degrees, years of experience, certifications, portfolios, etc. The way we describe our company is consistent with the Intercom voice and tone, developed by our content team. When it comes to writing your job descriptions, avoid making a laundry list of every single thing someone might be doing should they accept that role. Candidates only spend a short amount of time reading a job description before they make the decision to move forward or not. The key is to get them interested enough to apply so that you can get on the phone with them to describe some of the more nuanced or niche responsibilities. Treat a job description as your first opportunity to sell a candidate on a role (and if they apply, you know it worked). After a candidate applies, they are often left in the dark about what happened to their application. Was the role closed? Were they not selected? What does the interview process look like? When candidates are left with so many unanswered questions, they can start to feel like your company isn’t transparent enough. If you use an Applicant Tracking System (we use Greenhouse), set up an automatic ‘Thank you for applying’ email for candidates to be sent out after they submit their application. Take some time to write a message that is thoughtful – thank them for their consideration and let them know what the next step in the process it. Differentiate yourself from other companies doing the same thing by ensuring the message is warm, instead of stiff and cold. In the event that you close a role, let the candidates currently in the process know as a courtesy. This is hugely impactful to candidates because it shows that you recognize the time and effort they’ve spent going through your process, and they’re more likely to apply to other roles in your company that might be a better fit. When it comes to emailing a candidate (or any other written communications for that matter) the norm is to optimize for efficiency. You’re super busy so you’re probably not considering how thoughtful your email is, how much context you’re giving to a candidate about an interview, etc. But to the candidate, the small details matter and set you apart from other companies! Remember that you’re fighting to recruit top tier candidates against larger, more established companies that have more resources. An email that is more than just the standard ‘Be onsite from this time to this time’ can make a real difference. Here at Intercom, we don’t just tell a candidate when to be at the office. We let them know who they’re meeting with (including hyperlinks to the interviewer’s LinkedIn profiles), what the office attire is, how to get into the building, who to ask for – basically, all those questions a candidate is curious about to but too hesitant to ask. The more information you give a candidate, the more comfortable they’ll feel. We often forget how stressful interviewing is until we’re going through the process ourselves. By going the extra few feet here, you’re preparing the candidate for a great experience while also ensuring they put their best foot forward. We often forget how stressful interviewing is until we’re going through the process ourselves. Utilizing email templates and free tools like Text Expander are largely helpful with this problem. There is a little work upfront; you need to generate thoughtful templates and shorthand but once you do, your communications will quickly scale and you’ll be providing a more considerate and detailed candidate experience. Every time you speak or write to a candidate, it’s an opportunity for them to truly understand the culture and what it is like to work at your company. Candidate experience matters because it immediately starts differentiating your recruiting brand from other startups and begins the process of setting expectations of your company’s culture and vision. The value add in the additional work is finding the top tier talent you want and keeping them engaged in your process. Just as it’s important to be thoughtful in your communications to prospective candidates, it’s important to be considerate to candidates that you’re no longer going to continue the process with. Here at Intercom, every candidate that comes onsite get’s a call letting them know why we’re not going to be moving them forward with our process. This is an opportunity for us to ask about their interview experience at Intercom (giving us a chance to iterate on our process) and provide them with honest feedback that they can leverage in their job search. Remember, just because a candidate isn’t a good fit right now doesn’t mean they won’t be a great fit in the future. Don’t squander all of the time and energy you spent selling the opportunity and interviewing to go silent when you haven’t chosen them. If candidates walk away feeling like they had a negative experience after investing their own time to your process, the effects will be more than just a bad Glassdoor review. Their entire network is at risk of hearing that feedback which can seriously affect your ability to recruit top tier talent. As a startup fighting for top tier talent, it is important that candidate experience is a priority at your company. Regardless of whether an offer is made or a candidate comes onsite, everyone who enters your process will have an opinion about your company and its values. And you can guarantee they’ll share that opinion with others. Putting your best foot forward starts with small changes that can be iterated, automated and developed over time. Focus on making all parts of your candidate experience personal and you’ll not only catch the eye of top talent today, but future candidates as well.